France might be bruised, but it can't be held down: according to officials, over 3 million people, including 40 world leaders, united and marched in the streets of Paris today in the wake of last week's terror attacks that killed 17 people. "Indignation. Resistance. Solidarity. I am Charlie" read an invitation to the event that was circulating on social media. 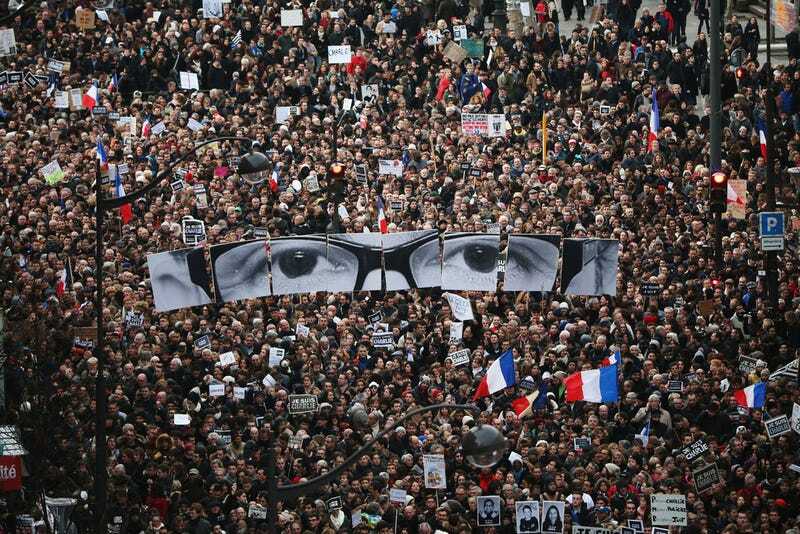 The organizers said the rally was to show support for freedom of the press and freedom of speech, and to reinforce the message that France and the French would not be cowed by terrorists. Outside of Europe, the international community has stepped forward to show its support, from political and journalist allies who've pledged allegiance to France and the freedom of speech, and Google, which has provided the satirical newspaper Charlie Hebdo with $300,000 so that it can print 1 million copies of its next edition (normally, the publication prints 60,000 a week).